I’m starting below another of my gradual real-time reviews. 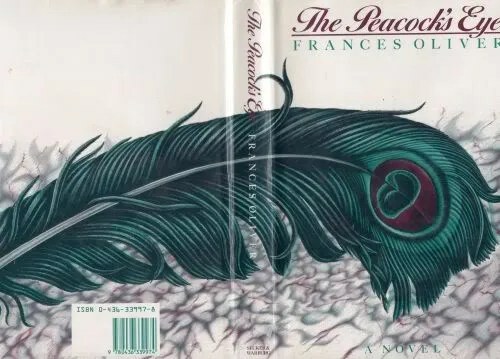 And it is of the novel entitled ‘The Peacock’s Eye’ by Frances Oliver (Secker and Warburg 1986). pp 16-22. As if trying to pin a donkey’s tail on a donkey while blindfolded, the narration of the biography (eventually arriving in 1944 Vienna?) plumps for identifying the narrator’s mother and, then, her mother’s mother (the biography’s official subject) arriving out of the blue with a young waif and stray from the war called Janka… We learn much. As we now wield clumsiliy a peacock’s tail towards an unknown target without yet hitting home. The house itself has its own waifs and strays of the novel’s characters. Let’s keep close to the narrator. Trust her. Little else we can do in this Proustian dream. For the time being at least. Loving every moment as a reader, meanwhile. My own myth is a pretence that I can manage this book in a real-time review. Nah! It grows beyond my ability to summon succinct summaries of character and event. While some become faint, others become bright, but we only have the narrative viewpoint to trust which is which. Mitzi herself has admitted defeat – effectively – inasmuch as this book is nothing to do with her grandmother or with others who are shouting from the biographical sidelines to keep the plot in check. It escapes even the poignancy of hindsight. Felix’s bravado, Stefan’s iconicity, Mitzi’s mother’s ‘mating’ habits. This a Mahler symphony. Each note (or word) larger in meaning than simply itself. It needs re-invention, needs packing…. Or presumably so thought Mitzi’s amoral half-brother Felix. He even uses Grandmother’s senility to befog his tracks. Not for me to say, but I sense a bit of this in Mitzi’s own method of narration-of-reality. Not only is it Betsy who has a fast-moving ‘sincerity’ on tap to suit each moment! Dysfunction and dissembling as a method of autobiographical insulation. An amusingly satirical interval where Felix falls foul of dog-food during his marital sojourn in America … and, upon his return to the family hearth in Austria – amazingly as it turns out by my premonition of ‘scrambled Shakespeare above – assumes the mantle of writing a serious work of literature upon which he is about to embark. Joshua has arrived on a visit and “what are, after all, only approximations to truth is getting the better of me again.” Approximations of truth: Mitzi writing her autobiography as a part of someone else’s biography, Joshua planning to write a competing biography(? ), the head-lease author (Frances Oliver) writing about Mitzi, Joshua et al, and me writing a review of all these tenants of truth via text and subtext…. It may be my inattentive fault as a reader, but, until this section, I had entirely forgotten (in my conscious mind) that Mitzi limped following the handicap caused by the aftermath of the Stefan affair – but realising it here amid the relative happiness of being in the handsome company of Joshua, Werner, and Felix – made it so much more effective a realisation for me. We hear talk of Grandmama’s papers. How many audit trails of reality can be found in private papers when compared to the faltering attempts of fiction as the ultimate truth, a fiction that created those papers in the first place? The sense of Joshua’s doom has been with us since the very start of this novel. But she did. She’s still alive for me today. A perfect ending to a perfect book. Yet artfully imperfect in its way of disguising fiction’s correlations with truth. I believe those letters were real in the same way as I believe that Mitzi believed, at heart, they were real and was therefore playing games with the reader when hinting that they were unreal. She was a tease. Still is. Joshua and Felix had something in common, not only the way they died, but their unrequited loves. Just a hoot that Felix married a dog food heiress then an angelic dancer then a show-jumper who used her whip too much. An aside. But sometimes asides are more important than the central action. Like in true biographies. I sense I am one of very few people in the world who has this novel on his bookshelf of favourite literary novels. That’s a shame – and a travesty.